You GUYS. Come over and I’ll make you green goddess falafel for dinner! Now this is my kind of meatless Monday. For real. Super heavy on flavor. Texture. Lots of things going on and just a bit high maintenance. I’m very into it! Last month when we went to Dallas for The Pretty Dish, we had grand plans of exploring all over and tasting everything. When we stepped off the plane and it was a feel of 21 degrees F, we were like whaaaaat. I mean, that’s nothing to us here in Pittsburgh, but we were completely underdressed and didn’t bring clothing warm enough to go explore everything. It sounded SO good to me. I ordered it, and they promptly erased it off the board – it was fate that I got the last one, right? I can’t even get over how delicious it was. Maybe it was before I was extra hungry or something, but it tasted fantastic. So different from something I would usually order. Incredibly satisfying too, but that’s no surprise. The falafel with the hummus with feta and tomatoes is this combo that I can’t stop craving. I have a baked falafel recipe here on the blog that I like to make with feta yogurt dip. It’s a great weeknight meal because it comes together quickly. This time though, I knew I wanted to make more of the real deal with some extra added greens! Green goddess falafel? Enter my green goddess dressing. While I didn’t use the dressing, I used all the green components of it to sneak in those vegetables. And I used dried chickpeas this time – it makes ALL the difference. Take the time and prep for this one. It’s so worth it. This is your go-all-out falafel recipe. The one you use when you want to decompress in the kitchen while blasting 90s Whitney Houston. And yes, I realize that I’ve gone a leeeeettle bit overboard with cauliflower lately. Is it still having a moment? I think so. SO I took my hummus recipe and just replaced with chickpeas with cauliflower. It tastes like cauliflower, but in creamy, decadent dip form. It was fantastic. Since the cauliflower is roasted before it gets pureed, it brings this incredible caramel-like roasted flavor that adds so much. Just grab a spoon for this one. There are SO many things you can do with this recipe. Obviously, throw in all in a pita or a wrap. Add the falafel on top of a salad with a scoop of the hummus. Serve on a plate like this with extra greens. The other thing is that the falafel reheat better than I expected. No, they aren’t super crispy on the outsides like when the first come out of the skillet, but if you heat them up in the oven again, they still taste awesome. I mean, I consider them a wonderful lunch the next day. It’s not a super easy weeknight dinner, but hello! Look at this plate. I can’t ever say no. 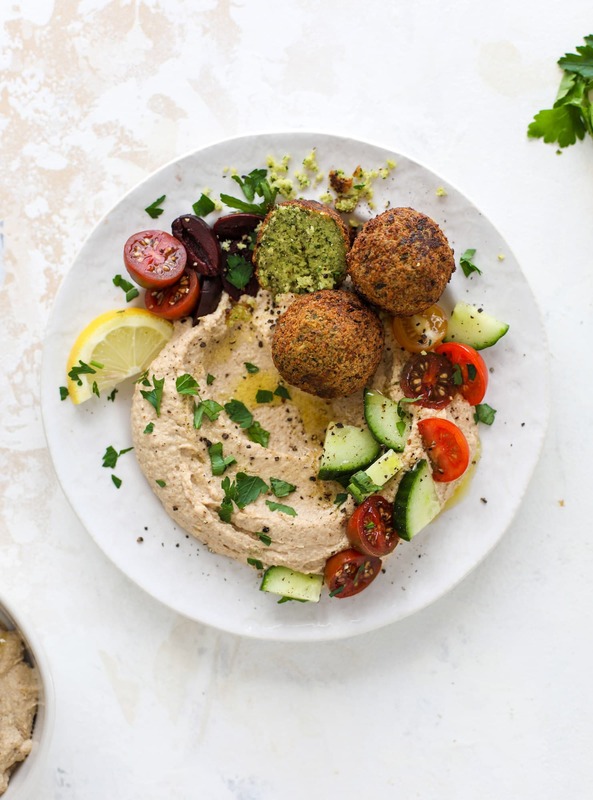 Green goddess falafel is hearty and flavorful, served over the creamiest cauliflower hummus, with tomatoes, olive, cucumbers and feta. Yum! Place the chickpeas in a large bowl and cover them with water – you want it a few inches above the chickpeas. Soak the chickpeas overnight and drain and rinse them in the morning. Place the chickpeas in a food processor. Add in the arugula, parsley, basil, chives, garlic, shallot, flour, cumin, salt, lemon zest, smoked paprika and pepper. Blend and pulse the mixture until it is combined and you have coarse crumbs. You want the mixture to have texture, so don’t blend all the chunks away! Line a baking sheet with parchment paper. 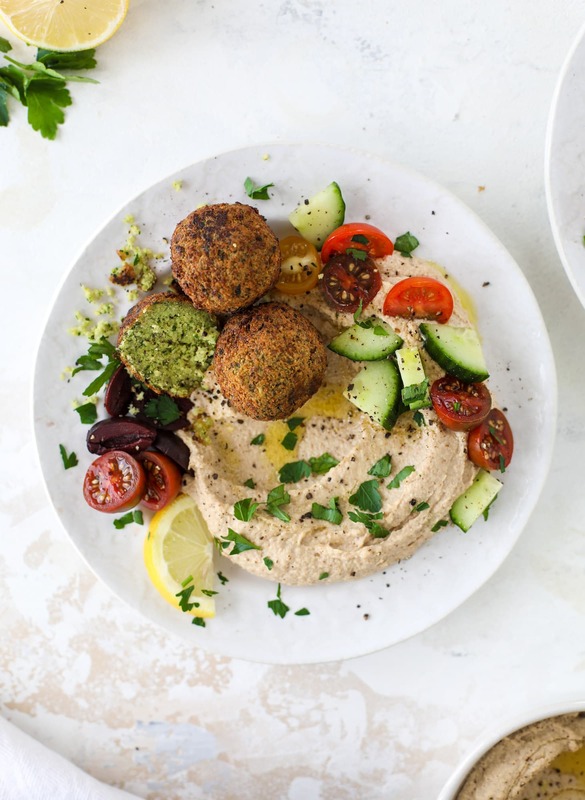 Take 1 to 2 tablespoons of the falafel into 1-inch round balls. I find that this mixture is like meatballs and comes together best when you use wet hands! Place the falafel on the sheet. Heat a pot or heavy skillet over medium heat. Add 1 to 2 inches of the oil. You want the frying temperature to be around 350 degrees F – even a few degrees higher if you plan to cook more than once. I cooked 4 to 5 falafel at one time. Fry the falafel about 1 to 2 minutes per side, until they are golden brown. Line a plate with a paper towel and once the falafel finish frying, use a slotted spoon to place them on a towel-lined plate. Serve with the cauliflower hummus and a sprinkling of chopped tomatoes, cucumber, chopped parsley and olives. You can add on crumbled feta, put these in a wrap, on a salad – whatever you’d like! To save leftovers, loosely wrap them in foil and keep them in the fridge. I heat my oven to 350 and warm them for about 15 minutes. Note: I have not tried freezing the uncooked falafel. I would suggest rolling the balls and freezing them, then thawing before frying. If you want to make a smaller batch, cut the recipe in half! Preheat the oven to 425 degrees F. Line a baking sheet with parchment or foil. Place the florets on the sheet. Spray with an olive oil sprtiz and sprinkle with salt and pepper. Roast for 20 to 25 minutes, until slightly golden. Place the cauliflower in the food processor and pulse and it’s in coarse crumbs. Continue to puree until it’s smooth. Add in the tahini, garlic, lemon juice, salt and pepper. Blend, scraping down the sides often, until the mixture is a smooth as you can get it. Stream in the ice water and continue to blend – this will help smooth it out a bit. Stream in 1 tablespoon of olive oil. Taste the hummus and add an extra pinch of salt and pepper if needed. This stores great in the fridge for a 2 to 3 days! Wow! Awesome that you got the last falafel. Love this homemade version, for sure… I haven’t had falafel in YEARRRRRRS (I’m ashamed, don’t worry). This looks wonderful and the cauliflower hummus…OMG! Question: Could the falafel be baked? Cauliflower is definitely having a moment! Like blue eye liner on the red carpet, and I am so here for both! Stoked to try this recipe; keep the cauliflower coming, Jessica! This looks and sounds INCREDIBLE. I am definitely making this over the weekend! thanks nicole!! i hope you love it! Can you speak on how the dried chickpeas might make a difference for how the falafel holds up? I have used canned chickpeas before with not much luck, but this may be the answer! If so, I will be really excited. Looks delicious! yes! so i was wondering the same before i tested these the first time – the canned chickpeas tend to have too much moisture so they don’t bind as well. the dried, soaked chickpeas give that classic falafel texture and bind much better! Do you think it would work with canned chickpeas? I have so many cans on hand, I would love to use them. no, no keep going with cauliflower stuff, anything to make it taste better than paper, so really appreciate this very creative recipe, so thank you! These were delicious and held together so well when I was making the falafel balls! My falafel completely fell apart once I put them in the pot. Do you know why that might happen? hi sara! did you use the dried, soaked chickpeas? or change anything else? usually the falafel fall apart if they are made with canned chickpeas! What type of oil do you use to fry the falafel?